Looking for something to do on the weekends? Animal Place will be presenting at three upcoming events! Close to home, we’ll be tabling at the Fair Oaks Chicken Festival this Saturday, Sept 21. We’ll be one of the few organizations supporting chickens, not exploiting them! Learn more about our adoption program! At San Francisco’s World Veg Festival, education director Marji Beach will offer unique perspective to the debate on “humane” animal products through the lens of a sanctuary. Join her Sept 29th at 2:15 pm in the Garden Club Room. 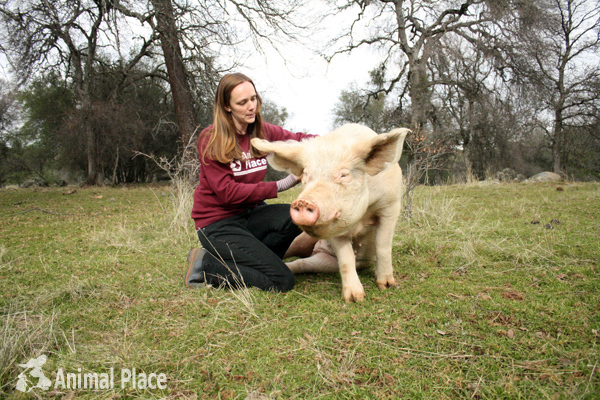 At Portland’s VegFest, animal care director Jamie London will host a Q&A for the screening of the Turlock documentary, the largest animal rescue in California history. Watermelon Radishes – They’re back! By request of one brave member, we’ve included the tops. (They are very bitter, but taste OK cooked). Most folks just eat the spicy and colorful root, raw or cooked. Lettuce – You’ll find either a Romaine, Butterhead, Green Leaf or Little Gem head of lettuce. 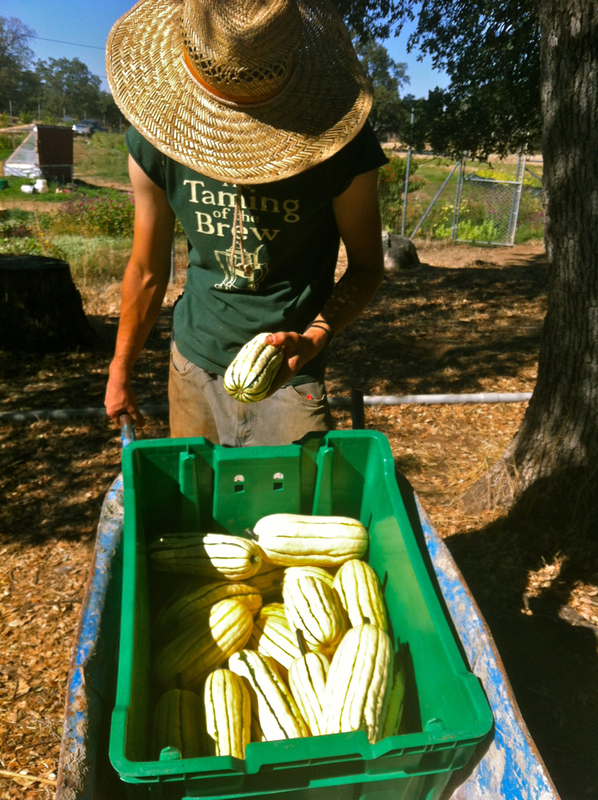 Delicata Squash – times two! Mixed Tomatoes – Yes, the yellow and green striped variety are ripe! Those are green zebras, and are super sweet even though they’re green. We’ve also included brandywine heirlooms and Rutgers beefsteak varieties. With less than six weeks to go, almost all of the fall crops have been planted. If all goes well, this fall you will taste our broccoli, spinach and cabbage. We are also growing celery for the first time, and have been watching it inch up for many weeks. Celery will need 100 days to reach it’s full height. 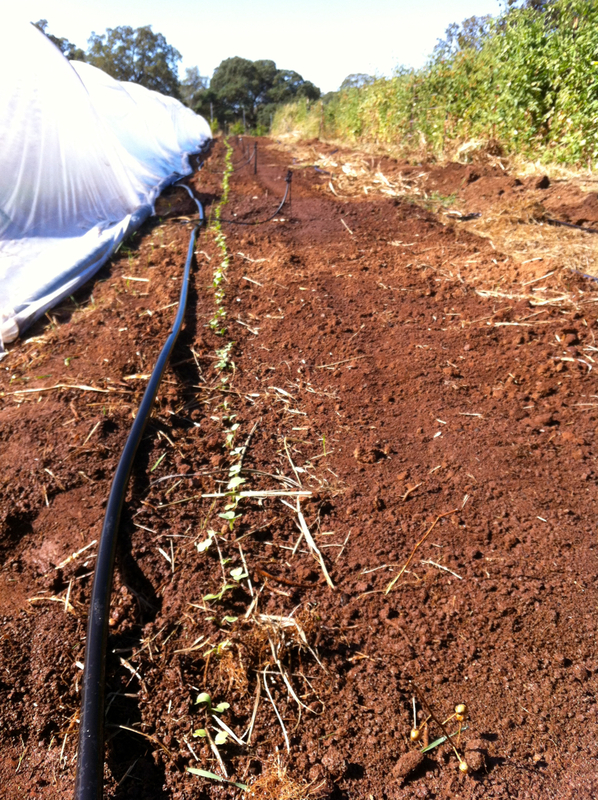 Radishes are our quickest growing vegetable, with some varieties maturing in just 25 days. This fall we are growing more of the pink beauties from springtime, as well as a purple variety and some “french breakfast” reds. Farmers Andy and Kim have been “succession planting” one row per week to spread out in your October boxes. 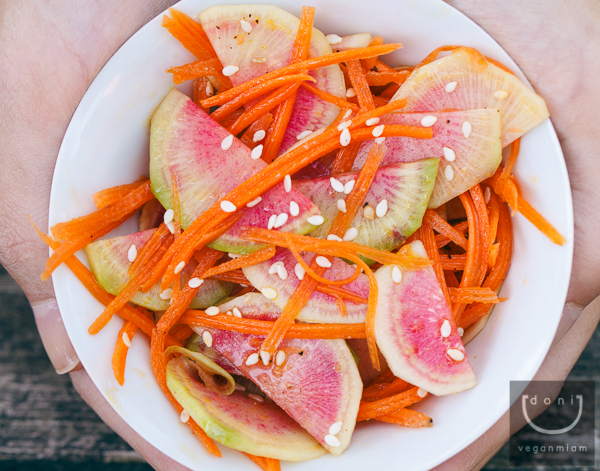 Prepare to julienne carrots and slice watermelon radishes and place them in a medium bowl. Whisk vinegar, coconut oil, garlic powder, toasted sesame oil, tamari, and sugar in a small bowl until it starts to emulsify. Pour your vinaigrette over the vegetables. Mix, add sesame seeds and season with salt and pepper. Refrigerate for at least an hour, covered with a lid to allow the salad marinate and serve immediately. Have you watched the video of the hens preparing for flight to New York? It’s rad! 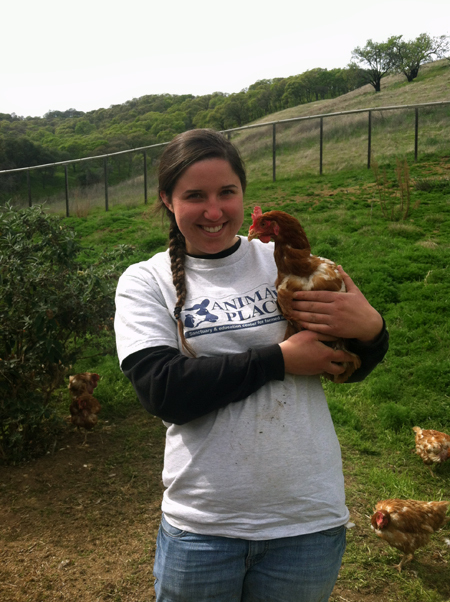 For all the latest hen updates, check out the Animal Place website. Delicata Squash – Incredibly sweet flavor and superbly delicate flesh. The skin is edible, so it’s not necessary to peel them unless you prefer it. We will likely give you another squash next week, so hold out if you need more for a big recipe. They store just fine for a few weeks at room temperature. Rainbow Chard – may still be bitter. When in doubt, cook them to neutralize the flavor. The recipe below is a great example of how to use the greens. We welcome farm intern Kim Waits all the way from the Washington, DC area, where she tended a home garden for her family. Kim is a substitute elementary school teacher, and has also traveled as far as India and Mexico for education-related service. 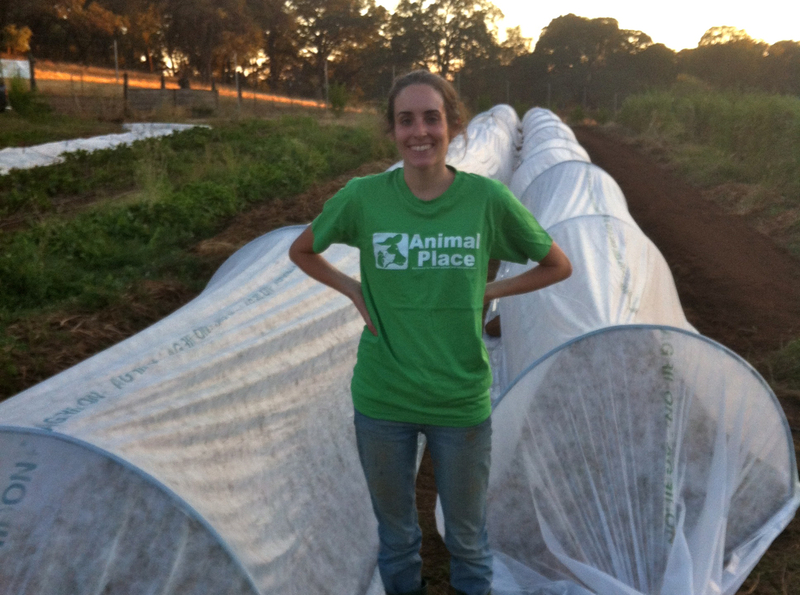 Kim will be farming with us for the rest of the growing season, and hopes to use this agricultural experience on her Peace Corps assignment in 2014 – 16. Drizzle squash slices with olive oil, salt and pepper, and roast for approx 20-25 minutes or until golden brown around the edges. (the time in your oven may vary). I also roasted my tofu cubes (with olive oil, salt & pepper) at the same time on a second baking sheet. Make the gravy recipe. Reserve the leftover bits of garlic, etc, after you strain it. Heat a bit of olive oil in a medium sized skillet. Add mushrooms, salt, pepper and the reserved bits from straining your gravy. Cook stirring occasionally until they’re golden and soft, about 8-10 minutes. Deglaze the pan with a splash of rice vinegar (or white or red wine), and continue cooking for another few minutes. Remove from the pan and set aside. You can either chop and cook your kale in the pan with your mushrooms or roast it in the oven. I have this new lazy technique where I take the whole bunch, drizzle it with a little olive oil and salt, and put the whole thing (bunched up) in the oven during the last few minutes of my roasted squash (for 5-8 minutes or so). Watch it and take it out when it’s wilted and the edges are just a bit crispy. Remove from the oven and chop it. 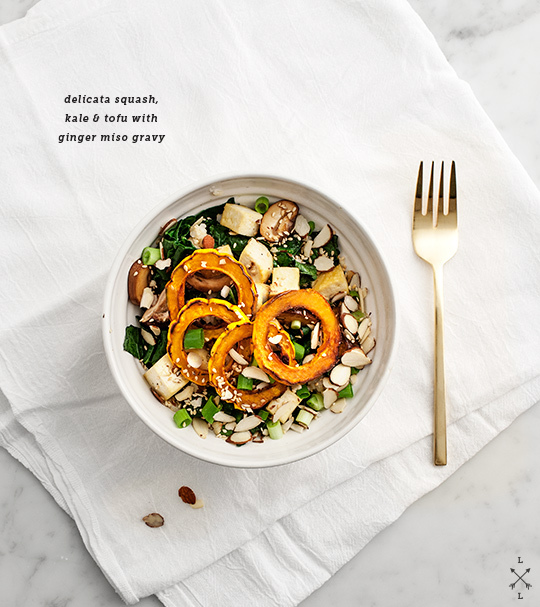 Assemble your bowls with rice, veggies, tofu, and toss with some of the gravy. Top with almonds, sesame seeds & scallions and serve with the rest of the gravy on the side. Box #15: Hens Take Flight Today! We are excited to announce that 1,150 of the 3,000 hens saved will be jetting in style across the country to sanctuaries and shelters on the east coast! A private donor is footing the bill, ensuring that no money is taken from the care of the animals at the sanctuary. Animal Place will be flying the hens out September 4th with a New York arrival on September 5th. Read more and leave a comment on MSN or the front page of Sacramento Bee. Rainbow Chard – bitter? Maybe. Farmer Greg says the raw leaves burn his throat, Farmer Steph doesn’t notice it much. When it doubt, cook the greens to break down the bitterness. 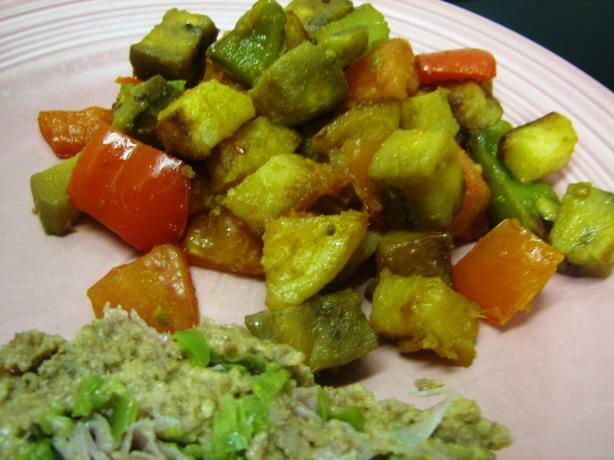 Try out the recipe below, by one of our very own Animal Place staffers. Rio Grande Russet Potatoes – Not your average russet, Rio Grande has elevated levels of antioxidants. 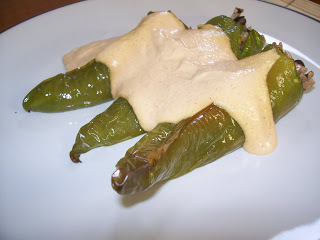 Great as a baked potato or fixed anyway you like them. School is back in session, and Animal Place enters its second season as a Farm to School partner. Farm to School is a national USDA funded program that connects schools and local farms with the objective of providing access to healthy food, improving nutrition and providing education in the areas of health, nutrition and agriculture. 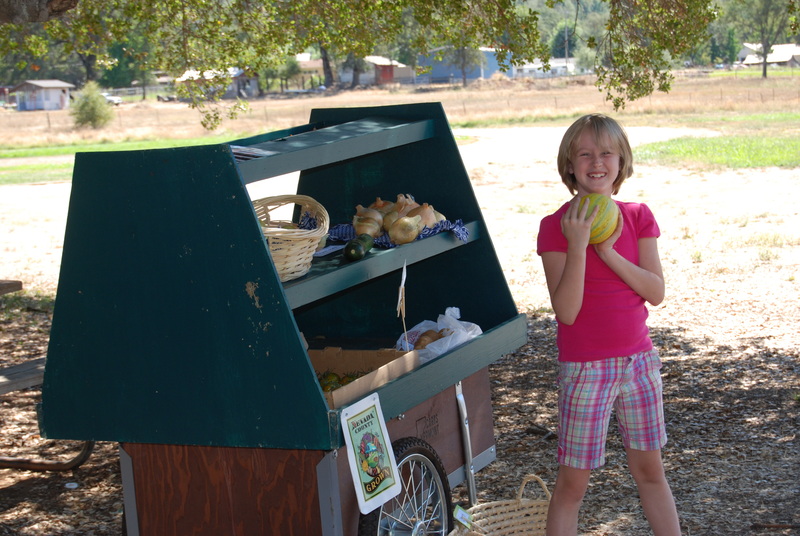 During our harvest season, we stock an after-school vegetable cart twice per week, making healthy, whole foods accessible to children and their families for free or by donation. Animal Place newsletters, which promote the benefits of a plant-based diet, are available alongside the fresh produce. 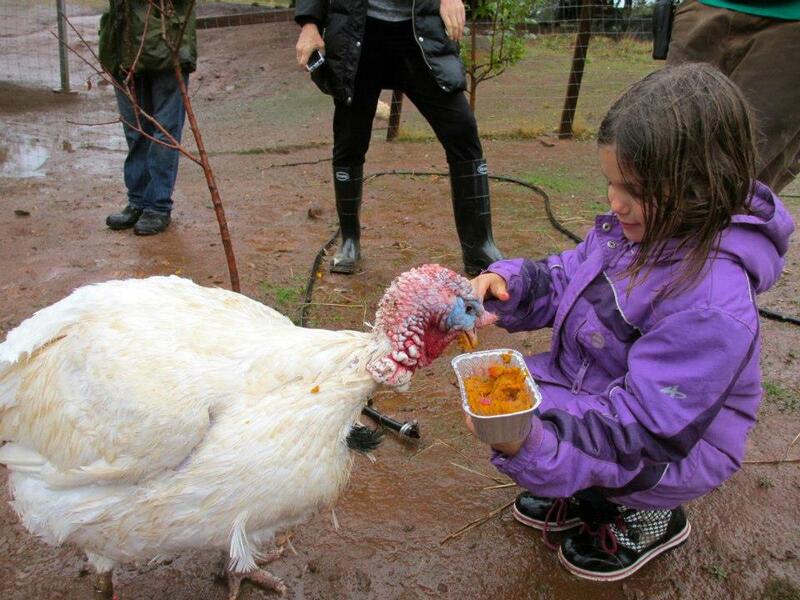 Twice per year, the students of local schools are invited to visit Animal Place for a tour of the animal sanctuary and veganic farm. 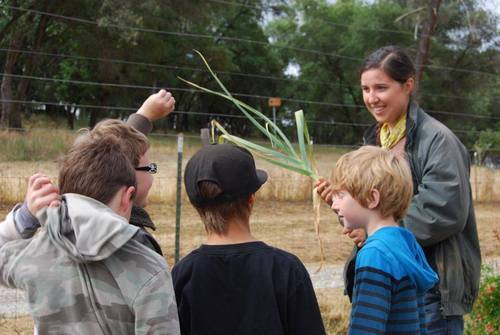 Students learn about plants, insects and food production with hands-on farm activities. In contrast, the sanctuary’s animal ambassadors present the sad story of agriculture based on animals. In a community that celebrates animal slaughter with youth agriculture programs like 4-H, it is crucial that children are exposed to the reality of animal suffering and the alternative of more compassionate ways to live and to farm. In a large pan or wok, add olive oil, onion and garlic. Cook over medium heat until onions become translucent. Remove the garlic and discard. Add the chopped Swiss chard leave and saute until soft, about 5 minutes. Season with garlic salt, to taste. Cook until the leaves are wilted. Serve immediately. Join speakers Colleen Patrick-Goudreau and Hope Bohanec at our 4th annual Thank the Turkeys celebration! Feed the turkeys, enjoy a tasty vegan meal, meet the animals, and bid on silent auction donations! 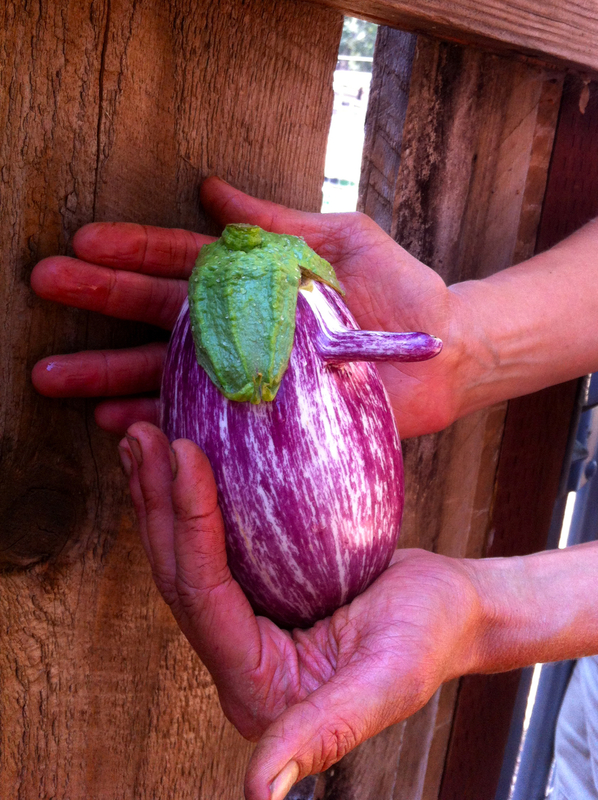 Listada di Gandia Eggplant – One of the most beautiful eggplants, a specialty purple-striped Italian with an oval shape. Check out the recipe below for an easy way to use many of this week’s veggies. Melon Surprise – you’ll get two, while they last! Enjoy some combination of Haogen (green), Rocky Ford (green), Swan Lake (white) or Cantaloupe (orange). 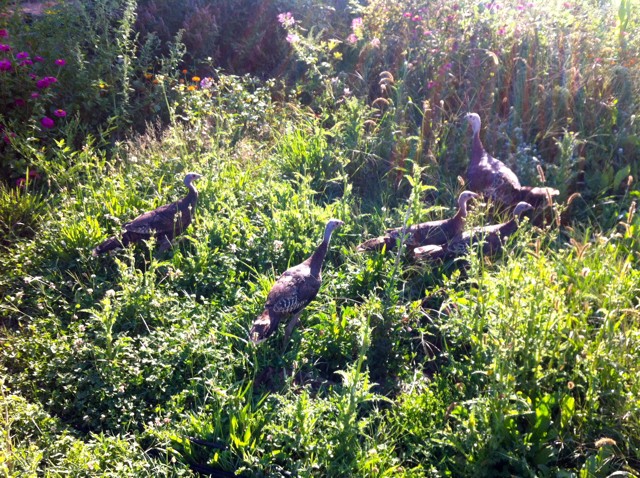 Every morning and evening, a family of wild turkeys visits the farm for a nutritious meal; usually from the compost heap and the lush weeds that are a signature of organic farming. They must have figured out that this is a sanctuary, a safe haven, for they don’t seem to mind us farming around them. As we dig up beds of potatoes, we prepare the soil for a second round of crops; we are a little late getting it in, but we’re hoping to give you a nice crop of broccoli and cabbage in your last boxes this October. 1 Heat the oil & garlic in a large frying pan over medium heat. 2 Saute the potatoes for 8-10 minutes or until lightly browned. 3 Add the onion & bell peppers and cook for 8-10 more minutes, or until the onion is lightly browned. 4 Add the zucchini & eggplant & cook for additional 5 minutes then add the tomatoes. 5 Season with the spices, pour in the water, & cook for 10-15 minutes more or until all the vegetables are tender. Interested in volunteering? We could always use a helping hand with the animals, on tours, at outreach events and of course on the veganic farm. Join us for a volunteer orientation this Saturday, 11am – 1pm. Please sign up online, and let us farmers know that you’re coming…we’d love to share a post-orientation melon with you. 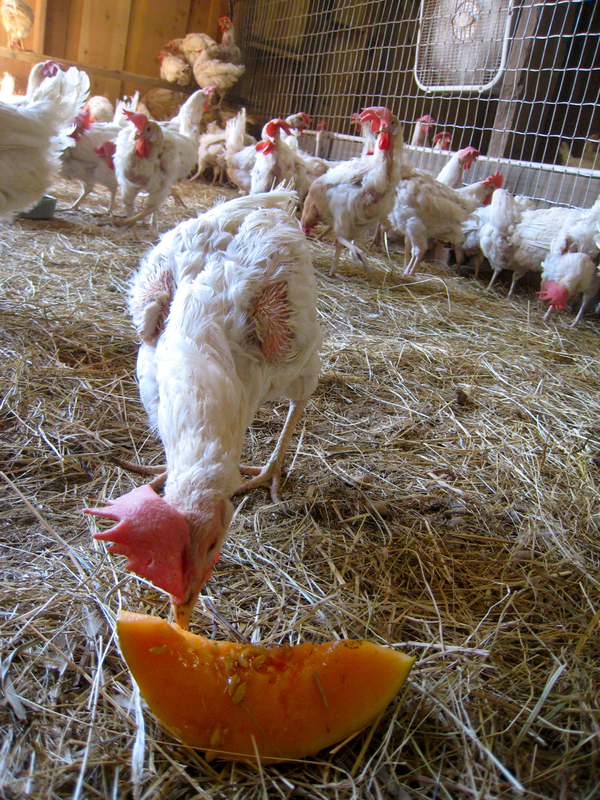 Cantaloupes and Haogen Melons – fresh-picked but ripe, so best stored & chilled in the fridge. 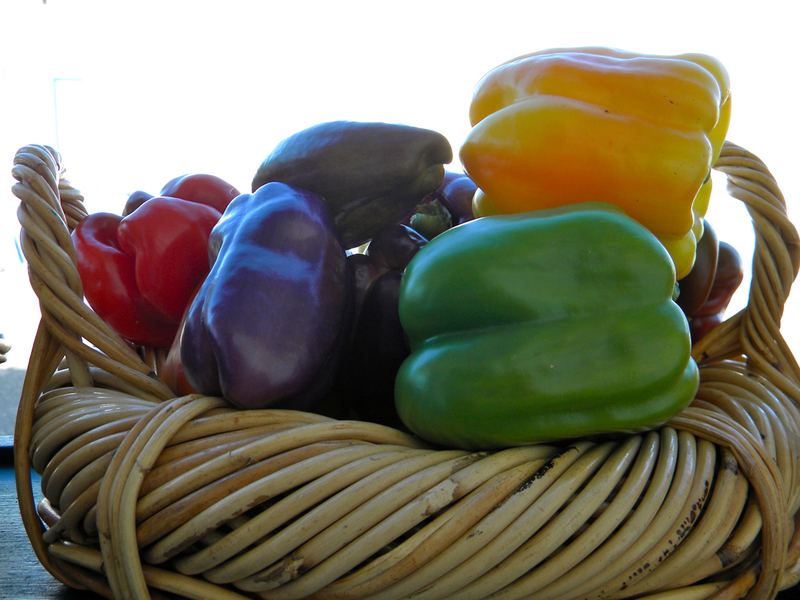 Rainbow Bell Peppers – you’ll get a combo of green, red, yellow, orange or purple. The taste is similar – sweet! Romaine and Butterhead Lettuce – times two! We don’t want to risk the lettuce “bolting” in the high temps this week, so we’ve included two heads this week. Fingers crossed that we can include lettuce again next week. Mixed tomatoes – we’ve had a tumultuous tomato season, due to an unexpected late frost back in May. In your box you’ll find some mix of Green Zebras, Rutgers beefsteak (unfortunately named) and Brandywine. It’s melon time! The seeds were planted in the springtime by a team of interns from both Animal Care and the Farm. For the second season in a row, melons have proven to be both an easy and abundant crop for us. We plant, water and wait. While the pigs are the most vocal and eager to devour this sugary treat, the chickens also enjoy pecking out the seeds and then gently nibbling away the rest. What a pleasure to watch our new hens, recently rescued from a miserable life, enjoy the sweet slices….finally, finally, enjoying a sweet life. 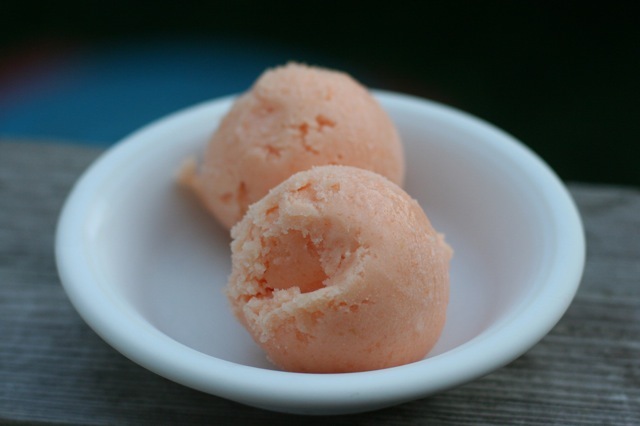 For those who wonder about the alcohol, it inhibits freezing and gives the sorbet a softer and smoother texture. You don’t have to use it, but it is better if you do. Box #11: Red Onions, Red Potatoes, Red Tomatoes! The recent rescue of 3,000 hens has been covered by News 10 Sacramento, Fox40 News, Vacaville Reporter, The Union and of course on the Animal Place website. Please share their story widely and help raise awareness and compassion for all species. Red Wing Onions – the ultimate sandwich onion! 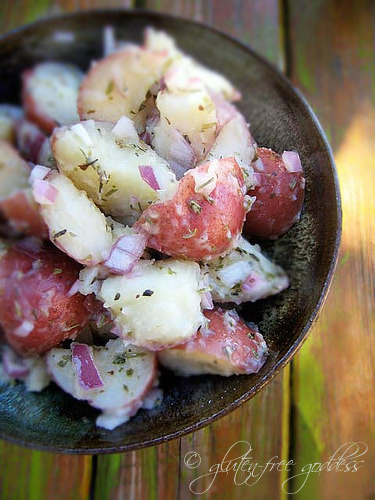 Colorado Rose or German Butterball Potatoes – use these plus the red onion in the potato salad recipe below. No mayo! We may not have enough red potatoes to go around, so some of you may get the perfect-sized German Butterballs. Mixed cherry tomatoes – yellow and red sweetness! A bigger bag. Black Beauty Eggplant – Slices work well on the grill, brushed with olive oil and basil. Are you interested in reading more about the veganic movement? 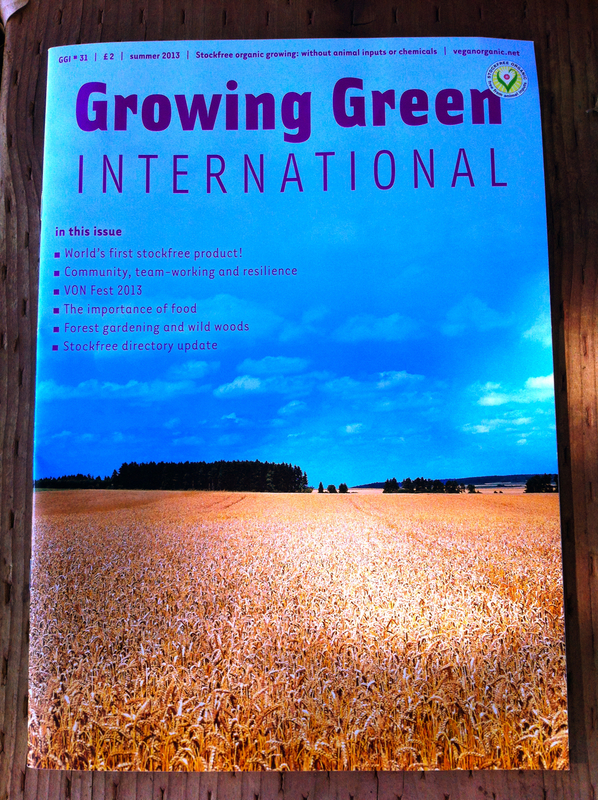 We recently published an article about our farm in Growing Green International, a UK-based magazine about vegan organic growing. Growing Green features a mixture of articles that cover practical, technical, and ethical issues, as well as more humorous items, hints and tips, letters and illustrations. You can subscribe online to this twice yearly publication. It’s barely a recipe. All you need is some good tasting extra virgin olive oil, a light but bracing vinegar, a diced red or purple onion, sea salt, fresh cracked pepper and some tarragon. Easy vegan bliss. Wash off the potatoes; leave the skins on. Cut the potatoes into quarters or bite size chunks. Put them into the water and simmer until fork tender – about 20 minutes. Drain the potatoes well and pour them into a large bowl. Add the onion and lightly mix. Add enough extra virgin olive oil to moisten the potatoes – about 1/4 cup or so. Drizzle liberally with the Champagne vinegar and toss. Taste test. Add more if needed. Don’t be stingy. And now you have a choice. You can serve it warm – which is divine. Or cover and chill it. Once chilled, taste test for seasoning adjustments because the chilling process dampens the flavors a bit.